The Z Factor Perfect Putting Machine has been ordered by PGA Tour members, PGA teaching professionals, golf schools and individual golfers of all skill levels. This is because all of these people know what an amazing revolution this product is with regard to teaching, learning and practicing the art of putting. The Z Factor Perfect Putting Machine actually allows you to see and feel the perfect putting stroke, which builds true muscle memory. The machine is adaptable to teach both the SQUARE TO SQUARE and ARC putting techniques. Square to Square (STS) With the Z Factor Perfect Putting Machine set up in the STS mode you will be learning the muscle memory of a SQUARE TO SQUARE putting stroke. In this stroke the putter travels straight back and straight through on the target line. The face of the putter is always pointed at the target during this stroke. This style of putting is used by golfers of all skill levels including PGA tour players, but may be especially helpful for beginners and for practicing short putts. Inside-Square-Inside (ARC) With the Z Factor Perfect Putting Machine set up in the ARC mode you will be learning the muscle memory of an Inside-Square-Inside putting stroke. In other words, the putter travels INSIDE the target line on the backstroke, returns to SQUARE at impact, and travels back INSIDE the target line on the follow through. This stroke is thought by some instructors to be more natural and resembles a miniature golf swing. During this stroke the face of the putter opens relative to the target line, but remains square to the arc along which it is swinging. Most of the players on the PGA tour use some variety of this method. Each Z Factor Perfect Putting Machine accommodates an optional clip on, rear-mounted alignment laser that illuminates the target line. The line projected by the laser will teach your eyes to identify the target line and help you aim your putter properly at address. 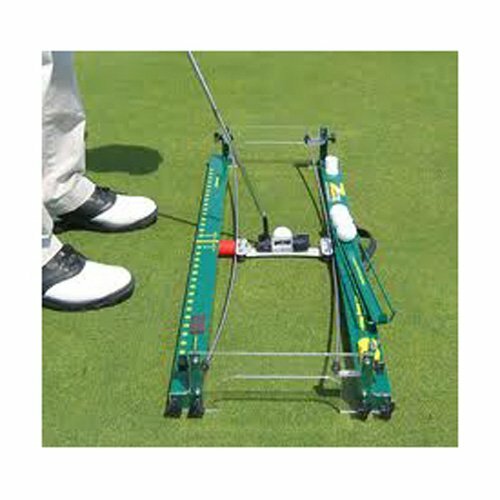 The Z Factor Perfect Putting Machine takes about 5 minutes to set up initially. Once it is set up, it is ready to use at your convenience. If you have any questions about this product by Z Factor, contact us by completing and submitting the form below. If you are looking for a specif part number, please include it with your message.